Rare Russian Demantoid Garnet Gem in Cushion Cut, Grass Green Color in 6 x 5.4 mm, 1.15 carats This Genuine Demantoid Garnet from Russia Gemstone Displays A Vivid Intense Grass Green With A Tinge Of Lime, Excellent Cut And Life. Horsetail Inclusions Visible With A Loupe, Super Lively And Bright With Great Dispersion. A Rare And Gorgeous Stone In A Very Attractive And Desired Shape, Very Fine. Garnet has a long history. Red garnet has been carved into decorative form, has been inlaid or set into things like sword hilts and shields and set into jewelry throughout history. According to the ancient Jewish text the Talmud, a garnet provided the only source of light on Noah's Ark. Garnet was also a symbol of one of the original 12 tribes of Israel and a birthstone. Some Asiatic tribes fashioned garnets into bullets believing that they would be more lethal than lead bullets. Like all gemstones, they go in and out of fashion. For example, they were very fashionable in Victorian jewelry. 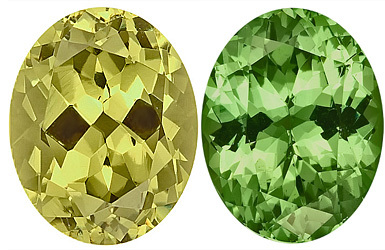 And when tsavorite green garnet and grape garnet first came on the market, they took the gemstone world by storm. For those who believe in the mystical uses of gemstones, garnet is supposed to help ground emotions, cure depression, give courage (remember it was used in sword hilts and in shields), protect against nightmares, purify the blood, regulate the heart and blood flow, stimulate success in business, bring popularity to the wearer, give the wearer self-esteem, protect one on trips, bring constancy to friendships, is a symbol of love and compassion. Garnet is the birthstone for those born in January and it is the zodiac gemstone for those born under the sign of Aquarius. It is the gemstone for the 2nd and 6th wedding anniversaries.Types and Colors of Garnet - Which Color Is Your Favorite? There are at least 13 types of garnet, but not all garnet is suitable for use in jewelry. The types of garnet most used in jewelry are almandine (almandite), andradite, grossular, pyrope and spessartite (spessartine). is typically deep red to reddish-brown. It can sometimes have a violet or brown hue. The term common garnet usually refers to brownish-red, opaque almandine that is used in industrial settings. Precious garnet refers to a deep red, transparent almandine that is suitable for use in jewelry. Almandine garnet is sometimes called Oriental Garnet. can be yellow, green, orange, reddish-brown, brown, gray, black and sometimes (rarely) colorless or white. Demantoid garnet is the emerald green to green transparent variety of this type of garnet that is suitable for use in jewelry. Demantoid garnet is very highly prized and one of the rarest of the garnets. 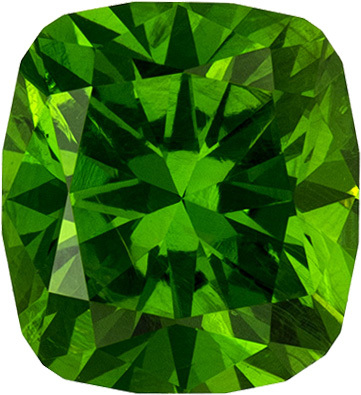 Demantoid was first identified in Russia in 1853. Russian mining of demantoid has essentially ceased but in 1997 there was a new find of demantoid garnet in Namibia. can be colorless, white, green, yellow, pink, brown, orange and orange-red in color. The member of this branch of the garnet family that is typically used in jewelry is tsavorite which is a chromium-rich emerald green variety of grossular garnet. It was first discovered in the early 1960s in Kenya and Tanzania and was named by Tiffany's. It is currently only found and mined in Kenya and Tanzania and tsavorite in carat weights over 2 carats are rare with carat weights of over 5 carats almost non-existent. like almandine, has been around forever and is one of the most common garnets. It is deep red to nearly black and can occasionally be rose-red to violet in color. 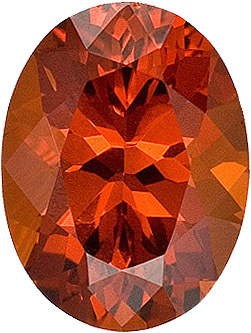 In the past, pyrope has also been called Bohemian garnet, Colorado ruby, California ruby, Rocky Mounty ruby, Elie ruby, Bohemian carbuncle and Cape ruby but use of these names is strongly discouraged by the Gemological Institute of America. can be found in brown, orange, pink and brownish-red. 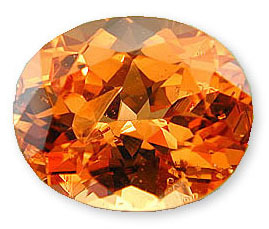 The first deposits of orange spessartite were found in Germany in the 1990s. Spessartite garnet is currently mined in Nigeria, Ramona (California) and Namibia. One will often hear the gem trade name of Mandarin, malaia or tangerine used to refer to the best of this popular garnet. Check out the "family tree" below for a more visual picture of how the elements may intermingle to create the beautiful colors of garnet. Because garnet comes in so many different types and colors, evaluating a garnet can be a little more difficult than it is with other gemstones. Color, cut and rarity are the most important issues. Garnet Cut - The cut and "make" (proportions) are very important when evaluation a garnet. If the make of the gemstone is not good, the garnet will appear dull and lifeless. Garnet Hue - The hue of a garnet will very much depend on the type of garnet. As a general rule of thumb, it’s probably best to look for a primary color in the 65% – 80% with any secondary hue (if there is any) in the 20% - 35% range. Garnet Tone - Here again the tone will primarily depend on the type of garnet. As a general rule, garnet with a tone in around the 60% - 85% range are probably best because garnets that are below 60% may appear washed out and those above 85% will appear overly dark. 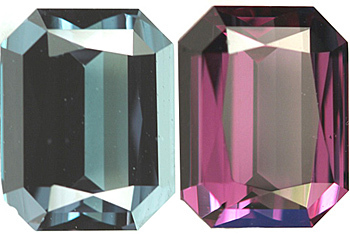 Garnet Saturation - Saturation ranges from "grayish / brown" to "vivid". Think intensity here. There are 6 levels of saturation with 1 being the most gray / brown and 6 being the most vivid. One must also consider the lighting source when evaluating the saturation. Some garnet colors actually improve under incandescent but some may pick up a dark gray / brown / black mask. For example, if considering a malaia garnet, a brownish mask may not be a bad thing. The brown might actually be perceived as a secondary hue if it is highly saturated. In that case, it is the total visual effect that one must consider. Garnet Carat Weight - Some in the garnet family frequently come in sizes up to 20 carats and more. Some don't get much above 1 carat in weight. It will all depend on the type of garnet you are considering. 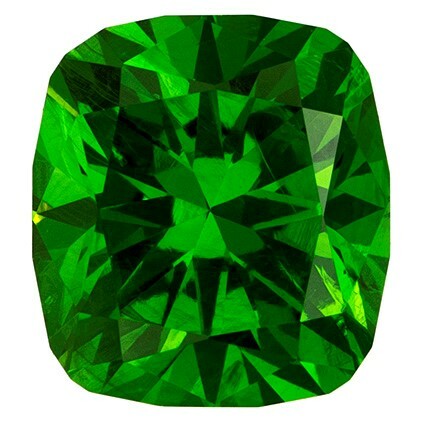 For example, the greater percentage of tsavorite garnets are less than one carat in size and tsavorite over 3 carats are considered very rare. It has been estimated that tsavorite over ten carats are about one tenth of one percent of total production. 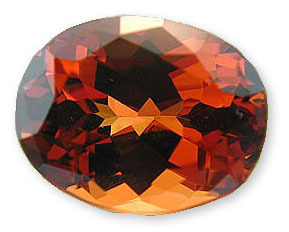 But Mozambique garnets can frequently be found in in larger sizes at very affordable prices. Garnet Clarity - Garnet is a Type II gemstone and may contain inclusions but the best will be eye clean. There are garnets that contain rutile inclusions that create a star (asterism) effect. These garnets are very, very rare. Garnet on Mohs Scale - Garnet is rated between 6.5 and 7.5 on the scale. The actual rating will depend on the type of garnet. They are very suitable for use in jewelry and generally are not brittle. 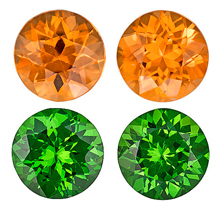 For example, tsavorite is rated between 6.5 and 7 and emerald is rated 7.5 to 8. But emerald is more brittle and is well known for chipping but tsavorite is tougher not prone to some of the issues with emeralds. Garnet Treatments - Garnets usually undergo no treatment, although their has been reports of demantoid garnets being heat treated. Garnet Gem Report - A buyer who is considering the purchase of a loose garnet gemstone should request a professional gemological report in order to help them know exactly what they are purchasing. Grading reports may be shown using a numerical value and / or percent or be given an overall letter (B thru AAA to GEM) and description "grade" for the clarity and color - it will depend on with which laboratory the gemologist trained. There are several recognized laboratories like Gemological Institute of America (GIA - uses the numerical scale), International Gemological Institute (IGI), International Gem Society (IGS), European Gemological Center (EGC) and more. Garnet Imposters and Synthetics - synthetic garnets are not commonly used in jewelry but are used in industrial settings. Some are useful in lasers. Yttrium aluminium garnet - commonly known as YAG was a clear synthetic garnet that was commonly used as a diamond substitute until cubic zirconia was commercially available in the 1970. Since cubic zirconia is a better brighter diamond substitute YAG has fallen out of favor for use in jewelry. AfricaGems has just received a beautiful new collection of rare Grossular Garnet Gemstones. These beauties display masterful cut and stunning color. Sourced from Mali, Kenya, and Nigeria, these exotic gems are the perfect stone for any gemstone lover. This collection offers gems in a range of colors from traditional mint green to intriguing brown with a hint of green and even icy yellow. Any of the matched pairs in this set would make absolutely stunning earrings, and the three piece set can be turned into a striking matching earring and necklace collection. Enjoy!